Most transplanted hairs fall out due to shock loss soon after a hair transplant. However, this case study may demonstrate how Accelerated Follicular Restoration™ (AFR™) could prevent shock loss and even allow long transplanted hairs to remain, creating instant results. A hair transplant doctor creates a fuller head of hair by moving hairs from one part of the scalp to another. Hair transplants are performed in an out-patient, clinical setting under local anesthetic while the patient is awake and resting comfortably. 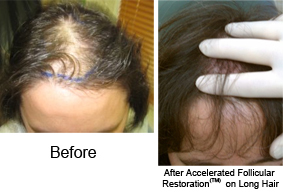 Dr. Shapiro, a hair transplant doctor in Florida, developed AFR™: Accelerated Follicular Restoration™. When Dr. Shapiro’s “Help Hair®” nutritional supplements are taken regularly after a hair transplant to accelerate results, this is called AFR, and it represents a big step forward in getting faster results with hair transplants. A study of AFR (a hair transplant plus the Help Hair Shake – a whey protein concentrate powder with added nutrients) revealed that transplanted hair started growing just 6 weeks after a hair transplant. The usual dormancy period is 3 to 6 months. At 3 months, all subjects had at least 3/4″ long transplanted hair, which is unprecedented. Clearly, the Help Hair Shake affects and accelerates the growth of hair. A long-haired female patient presented at Dr. Shapiro’s office with diffuse, female pattern hair loss. She wanted to keep her long hair, and not wait months or years for the transplanted hair to grow the same length as her non-transplanted hair. Normally, the transplanted hair enters into the dormancy phase for several months after transplantation and then may need significant time to grow to the same length as surrounding hair. Dr. Shapiro performed a hair transplant, but instead of trimming all the transplanted hair, he used the hair full-length for part of the transplant. The patient immediately starting taking the recommended dosages of Dr. Shapiro’s Help Hair Shake after the transplant. It would be expected that, like the vast majority of patients, this patient would lose the transplanted hair within 6 weeks. At 6 weeks after the procedure, however, the patient was examined and the long hair was still intact. The patient was extremely pleased that her transplanted hair did not fall out and go into the dormancy phase after the transplant. She walked out of the office with a fuller head of hair, and kept that hair. See images at the top of this page. See more images and quotes from the patient. The transplanted hair that was trimmed grew in quickly. This was aligned with the AFR study. This case study points to the need for further research into AFR and Help Hair Shake as a means of obtaining quicker, and even instant, results after a hair transplant. 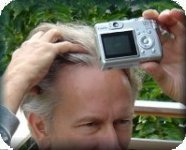 This entry was posted in Hair Loss, Hair Loss in Women, Hair Transplant, Hair Transplants on January 18, 2011 by Larry Shapiro.